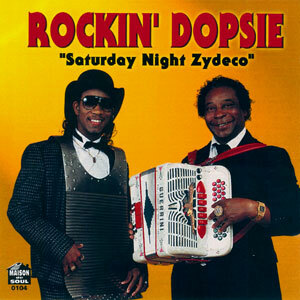 If Clifton Chenier was the king of zydeco music, Rockin’ Dopsie (pronounced “doopsie”), with his unequaled proficiency on the button accordion, was its crown prince. Like Chenier, Dopsie was devoted to preserving the old French songs that form the basis of zydeco. He was born Alton Rubin in Carencro, LA, a small town near Lafayette. He spent much of his childhood picking cotton and working in the cane fields. His father played accordion and performed at local weekend house parties. He frequently brought young Rubin along. His father gave him his first small accordion when Rubin was 14. He then told his son that he must teach himself. A lefty, Rubin played the accordion upside down, learning tunes off the radio. It didn’t take long before he began playing parties and gaining a reputation as an even better musician than his father. Rubin eventually moved to Lafayette and began performing in blues clubs in the ’50s with his cousin Chester Zeno on washboard. During the day, Rubin worked as a hod carrier. He took his stage name from a Chicago dancer who had come to perform in Lafayette. Like his namesake Doopsie, Rubin also had a reputation as an excellent hoofer. Later, the accordion player was given the name Rockin’ to describe his lively playing. Over the years, Rockin’ Dopsie performed zydeco in clubs, and despite Chenier’s advice, continued working day jobs, eventually becoming an electrical contractor.